Over the past decade, Dr. Richard Hovannisian, emeritus professor of Armenian and Near Eastern History at UCLA, has edited a series of illuminating volumes that explore various facets of Armenian history and society in Armenian cities and provinces under the Ottoman Empire. 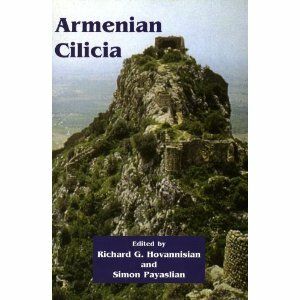 Armenian Cilicia, published in 2008, is the seventh volume in his series and focuses on Cilicia, a coastal region in southwestern Turkey that was the site of an Armenian kingdom during the Middle Ages and that maintained a significant Armenian population until 1915. Together with Simon Payaslian, Dr. Hovannisian brings together articles from scholars in various disciplines (history, literature, geography, political science, art history, women’s studies, etc.) on topics that span over a millennia in time. Beginning with a historical geography of Cilicia, the themes of the chapters range from the role that Cilicia has played in a religious context to the impact of the region on the writings of Armenian-American authors. Armenian Cilicia and the other books in Dr. Hovannisian’s Armenian History and Culture Series are particularly noteworthy because they document an active Armenian presence in places where Armenians no longer live. Books like these combat the efforts of those who stubbornly attempt to erase any trace or memory of an Armenian population in modern-day Turkey. By taking the reader through the considerable contributions of Armenians to Cilicia and to other regions in modern-day Turkey, Dr. Hovannisian illustrates why Armenians are still so inextricably intertwined with the memory of their homeland, even after having lived outside it for almost a century.